This is where Technical Analysis all begins, guys. This is supply and demand 101. We talk about momentum and we talk about trends. We use words like Volume and Moving Average. This is all fine and dandy, but all of these are only a supplement to actual price analysis. Price is the only thing that pays. So price, by definition, is the most important technical indicator that exists. 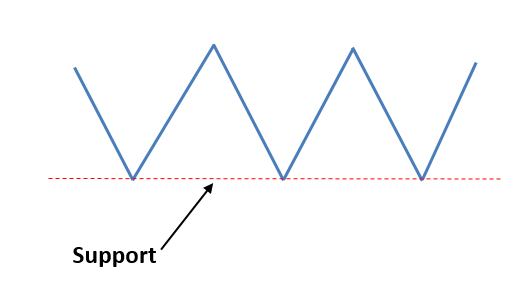 Support is a level in a declining market trend where there is a temporary halt due to more buying pressure than selling pressure. These are the “troughs” in the market. They’re reaction lows where demand overwhelms the amount of supply. Since there is enough buying pressure here to overcome any selling that there might be at this level, the result is a pause in decline where prices then reverse back up again. 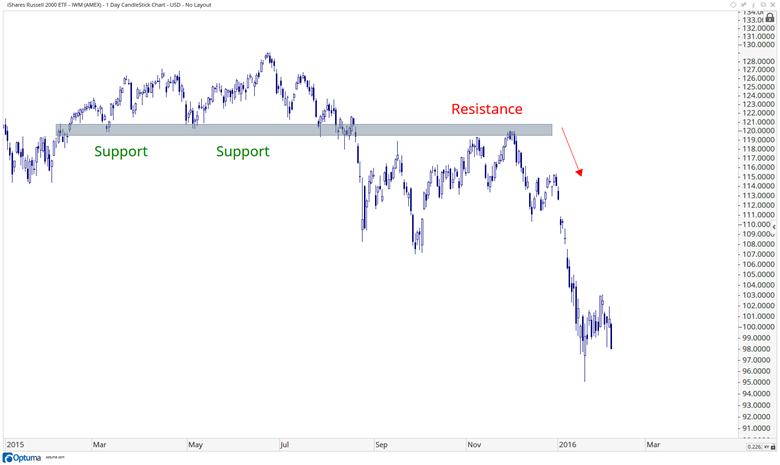 Resistance is the exact opposite of support. 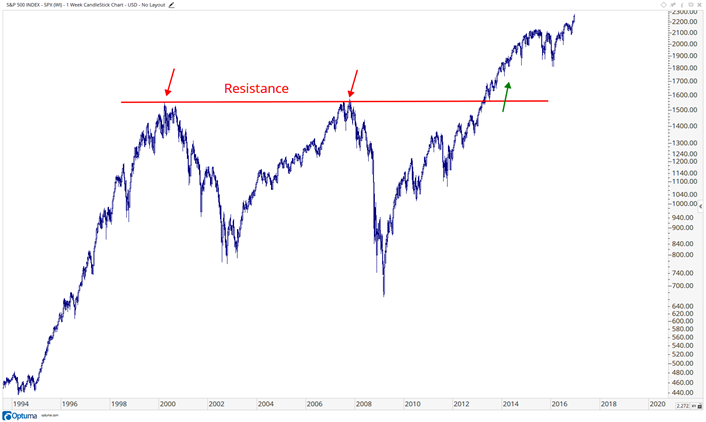 Resistance is a level in a rising market where there is so much more selling pressure than buying pressure that there is a temporary halt in the uptrend. 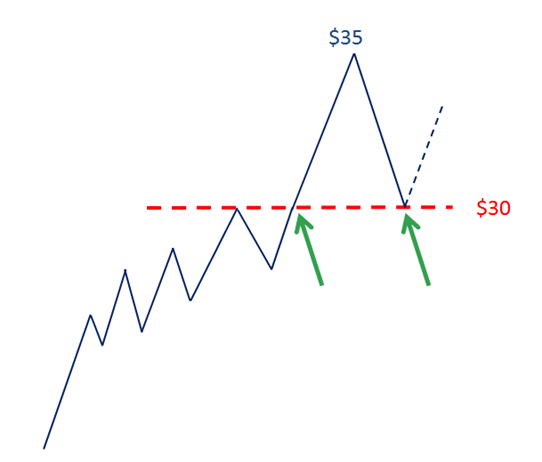 These are the “Peaks” in the market, or reaction highs, where supply exceeds demand. Since there is enough selling pressure here to overcome any buying, prices stop rising and reverse back down again. 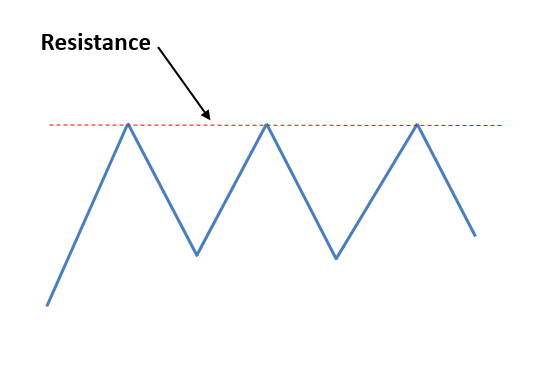 A break above resistance is considered to be bullish while a break below support is considered to be bearish. In these charts, you can clearly see where support and resistance come into play. The red dashed lines represent where prices stopped appreciating and for whatever the reason, supply now exceeds demand. Same on the flip side where prices stopped falling and for whatever the reason, demand now exceeds supply at that particular price point. Remember, we don’t care “why” prices stopped falling. We’re just observing the market proving that this is indeed the fact. One can’t argue that at these resistance levels, there are more sellers than buyers. Same thing on the way down. These support levels are recognizable and are very clear. It is a fact that at these levels, prices stopped going down and reversed up because there is now more demand than supply, for whatever the reason. The supply and demand principles detailed above can be applied to all liquid assets: stocks, indexes, ETFs, commodity futures, forex, interest rates etc. So when we refer to a “market” or a “security”, these words are being used to interchangeably describe a liquid free market. These principles can also be applied on various time horizons. You could be looking at a 20 or 30 year weekly or monthly chart, which many would consider long-term and you could also be analyzing short-term daily charts, or even intraday. The one thing I will say is that the larger/longer the time horizon in question, the more powerful these principles above tend to be. This is due to the amount of volume taking place at these key turning points. Obviously 20-years of resistance, for example, is going to be much more difficult to penetrate than 20-minutes of resistance on say, an intraday 1-minute chart. 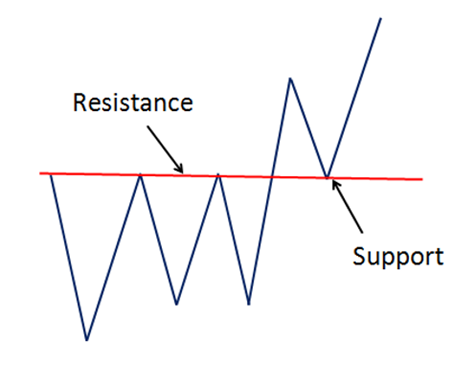 The added value of recognizing where support and resistance is that they are constantly turning into the other. 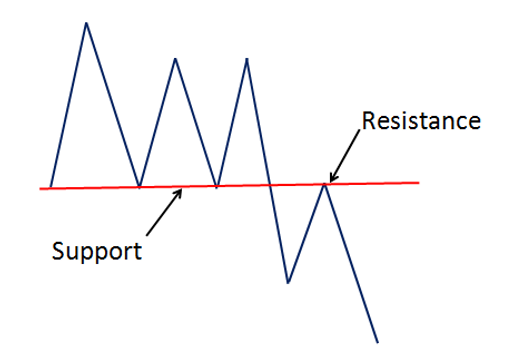 You’ll often see former resistance turning into support and former support turn into resistance. The psychology behind this concept is very interesting and it’s important to understand. There is a reason why this works. Let’s use the above example of former resistance turning into support. For the sake of this argument, we’ll say that someone recommends a stock to you and it’s at $30 per share after it breaks out above former resistance. 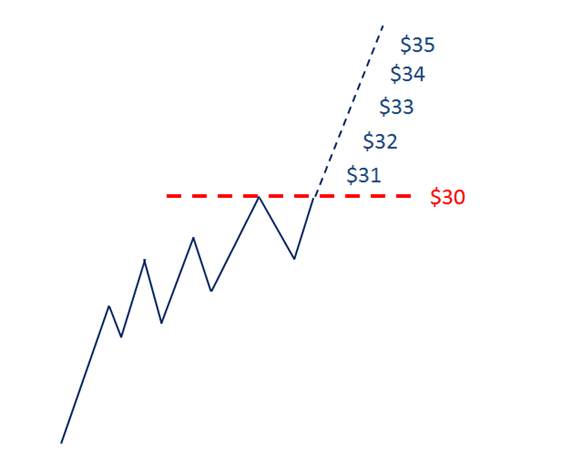 You start watching it slowly creep up $31, $32, $33… and you say to yourself, “Damn, if only I had bought it at 30 when I had the chance” Well ultimately the stock gets up to $35 and you’re really feeling the frustration. All you want is for the stock to get back to 30 so you can buy it like you believe you should have done the first time. Well, the stock then starts to fall back down after hitting $35. 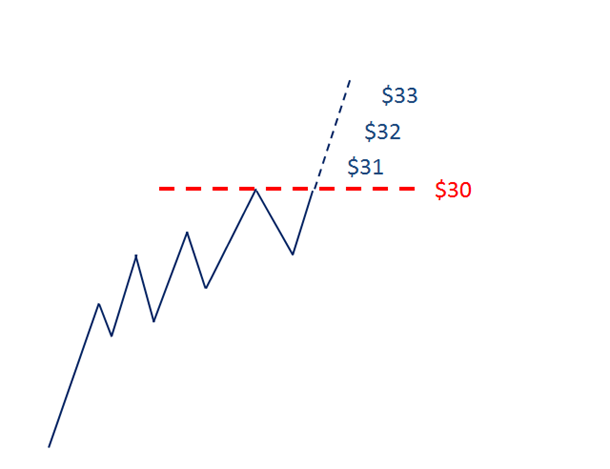 It goes down to $34, $33, $32… and eventually all the way back down to $30, which is where the stock was when you first started to watch it. So what do you do of course? You buy it, because you missed out on a pleasurable experience the last time you had this opportunity and passed on it. There is also demand there from people in your same shoes. Meanwhile, let’s go back to when you first had the chance to buy it at $30. Let’s say this time you did buy the number of shares you should have bought when given the chance. 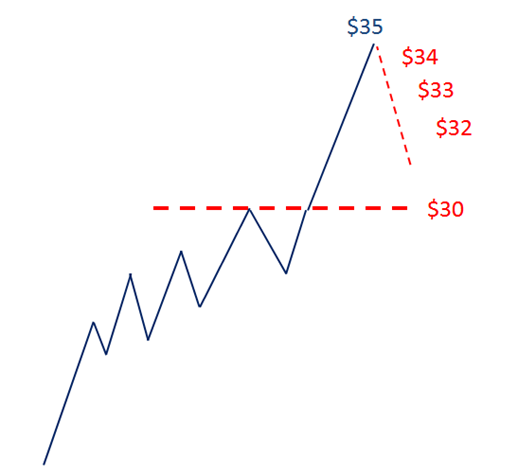 The stock you own starts to appreciate: 31 dollars, 32 ,33……and eventually hits 35 dollars. You are delighted, of course, but the greed factor kicks in and you likely regret not buying more shares. If the market would get back down to where you bought it originally, you can add to your long position and have the size that you think you should have on, based on your pleasant experience the first time you bought shares at $30. So when prices start to fall, back towards $30 you purchase more shares. Either way, whether you bought shares the first time or not, there is market memory there where many shares either exchanged hands or should have exchanged hands. So when the market gets back to former resistance levels, support comes into play and the market bounces. Remember, this is what we call polarity. Now, let’s assume that you weren’t approaching this market from the long side, and instead were looking to short the stock at $30. You immediately pull the trigger and sell shares short, betting that the stock will go lower, which is how shorts make money. It’s nothing but pain you’re feeling as you watch it creep up $31, 32, $33…..it’s not a pleasurable experience. All you can think about is the stock getting back down to where you originally shorted it so you can buy it back, cover your shorts, and move on from the pain you just felt watching your short rip $5 in your face. Eventually when prices return to $30, you cover your short positions at break even so you don’t have to experience that pain anymore. There is market memory here at $30 and buying pressure that comes from shorts who were in the wrong trying to unwind their positions. While this is all happening, the volume levels are increasing depending on how many of the above scenarios are taking place in the minds of traders and investors, or algorithms they may have built. 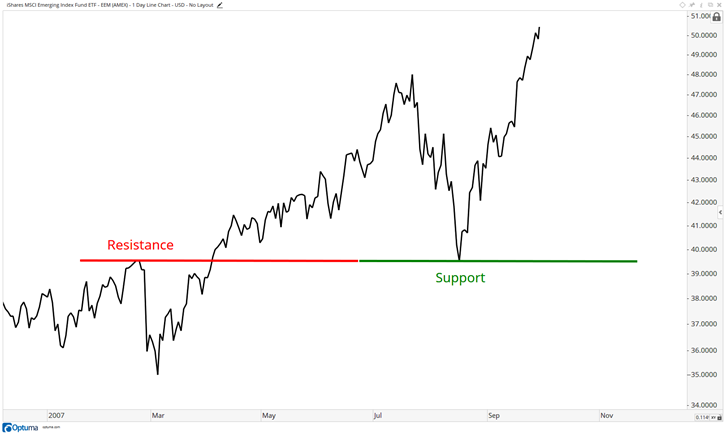 While we can never be certain whether former support will turn into resistance, and vice versa, past price behavior can definitely give us increased probability. With that in mind, remember that price will do what it wants. We gather all of the data and use a weight of the evidence approach to defining risk management levels and price targets. The market acknowledging overhead supply (resistance), or demand underneath (support), or blowing right past it like it’s not even there tells us a lot about the strength, or weakness, in a given market. This is just as important. The more volume that takes place at or near a specific price, the more important the levels become. This can be measured by using a volume by price chart where you have horizontal lines representing volume overlaid with the security in question plotted using the x and y axis. But after you’ve been doing this for a while and look at as many charts as a lot of us do, you can just tell where the volume is just by looking at the chart. Therefore, for me, it’s not necessary to plot a volume by price indicator because it just clutters the chart for no reason. But for beginners, it’s probably not a bad idea to use them. 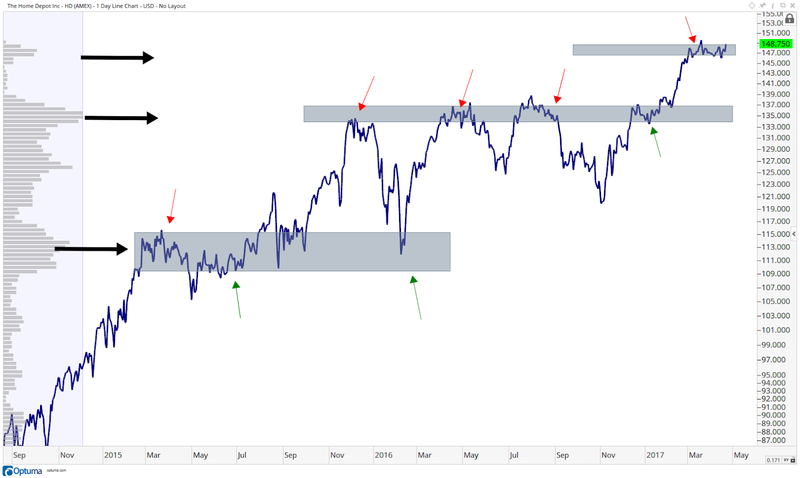 Here are Semiconductors in 2015 showing support near 120 dollars throughout the Spring and Summer. When that broke in late August, prices fell dramatically. Upon returning to that 120 level for the first time again late in the year, that former support turned into resistance. This is a perfect example of Polarity, where support turned into resistance. Here are Emerging Markets $EEM running into resistance in early 2007 above $39, which after breaking out above it, then turned into support on the retest of the breakout level. This is another good example of the polarity principle. The point is that there is a lot of memory at specific prices that help us manage risk as well as to know where to take profits. This allows us to calculate a risk vs reward profile for every single liquid asset in the world, from Apple, to Google, to Soybean Futures, to a Singapore ETF, U.S. Treasury Bonds, etc. Supply and demand dynamics, our own fear and greed, are blind to the asset class. These principles can be applied across the board. They can be seen in markets as far back as the 1800s and can be seen in today’s market environment, Fed or no Fed intervention, Yellen or Greenspan or Bernanke. None of that noise matters to supply and demand. We are all that matter. And while markets evolve over time through technological advances and exchange rules, the one constant is us. That won’t change. We drive supply and demand. 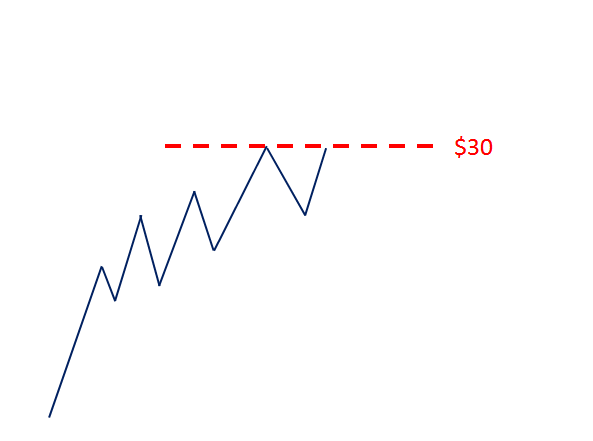 The psychology behind this support and resistance levels makes a lot of sense. This is why technical analysis not only works, but as market participants, it would be irresponsible of us to ignore. We see these key levels of supply and demand doing what they do in all sorts of different asset classes on many time frames, long-term, short-term and everything in between. Lesson 1:What is Technical Analysis?